procedure is performed for the treatment of severe joint conditions causing hip dysfunction and pain. 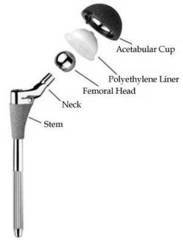 The two prosthetic components, the acetabular and the femoral stem and ball, model the anatomy of the original hip. The goal of the procedure is pain relief and restoring function to allow the patient to return to daily activities and hobbies. The hip joint is a multi-axial ball and socket joint designed for stability and weight bearing. The hip is a synovial joint with an articulation between the acetabulum and the head of the femur. 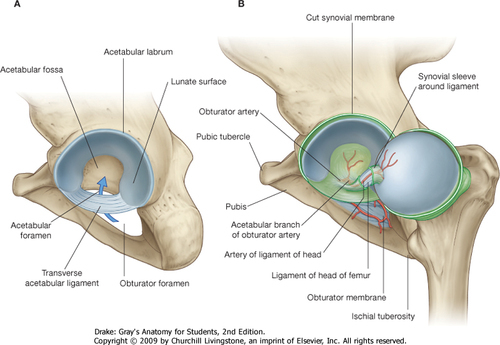 A branch of the obturator artery supplies the head of the femur. Hyaline cartilage covers the acetabular fossa and the head of the femur. A synovial membrane covers the ligament of head of femur and blends into the fibrous membrane. The fibrous membrane medially attaches to the outside of the acetabulum, and laterally to the intertrochanteric line of the femur. 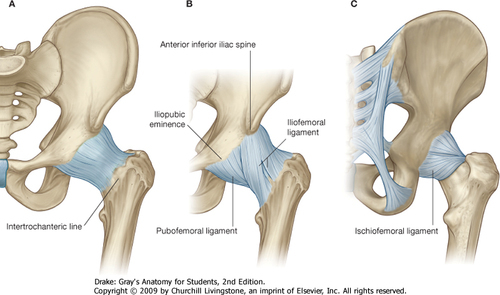 The ligaments that help stabilize the joint are the: iliofemoral ligament, pubofemoral ligament, ischiofemoral ligament. The surgeon has two options for the selection of the surgical implant. Both options are chosen for different reasons. It is important to have a discussion with the surgeon on what implant is most appropriate. The patient is placed in a lateral side-lying position with the affected hip exposed. The Surgeon makes an incision starting at the upper thigh that goes up towards the buttocks. The incision is made through the tissue, muscle, and capsule of the affected hip to expose the joint. The surgeon dislocates the hip joint and prepares the bone for the prosthesis by removing the head of the femur and reaming out the intermedullary canal. 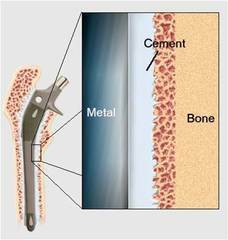 The socket is prepared by smoothing the bone down to make an even sphere. The cup and femoral stem are press fit into the joint. 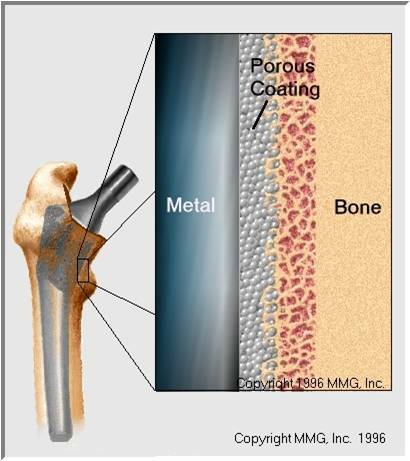 The prosthesis is roughened to encourage bone growth during recovery to secure the prosthesis. A trial prosthesis ball is connected to the femoral stem. The surgeon checks the fit through all directions. Once the correct fit is chosen, the permanent head is placed and the patient’s range of motion in the hip is rechecked. The Surgeon closes up the wound and dresses it with gauze. Some surgeons will place a drain to help remove excess fluids. An abduction brace is placed on the surgical leg to prevent adduction, a position of risk for dislocation. Weight bearing status: Cement implants are weight bearing as tolerated; Cementless implants are touch down weight bearing for 6-8 weeks post-surgery. 1. Siopack JS, Jergesen HE. Total hip arthroplasty. West J Med. 1995;162(3):243-249. http://search.ebscohost.com/login.aspx?direct=true&AuthType=ip,url,cookie,uid&db=rzh&AN=1998079833&site=ehost-live&scope=site. 2. Bozic KJ, Rubash HE, Berry J, Saleh K J, Durbhakula S M. Modes of failure in revision hip and knee replacement. www.cdc.gov/nchs/ppt/icd9/att_TJR_oct04.ppt. Accessed November 11, 2001. 3. Drake RL, Vogl WA, Mitchell A. W. M. Schmitt W, Gruliow R, eds. Lower limb. In:Gray's anatomy for sudents. 2nd ed. Philadelphia, PA: Churchill Livingstone; 2010:528-535. 4. Mayo Clinic Staff. Hip replacement. Mayo Clinic Web site. http://www.mayoclinic.com/health/hip-replacement/MY00235. Updated 2011. Accessed November 27, 2011. 5. Hecht M E. Craig K, ed.Total hip replacement In:A practical guide to hip surgery: From pre-op to recovery. North Branch, MN: Sunrise River Press; 2011:28-30. http://books.google.com/books?id=rATPBt0-rn8C&pg=PA28&dq=total+hip+arthroplasty+steps&hl=en&ei=J1fNTpfuKaHe0QG3n9AN&sa=X&oi=book_result&ct=result&resnum=3&ved=0CFEQ6AEwAg#v=onepage&q=total%20hip%20arthroplasty%20steps&f=false. Accessed November 11, 2001. 6. Hip replacement rehabilitation. Hip Replacement Rehabilitation Web site. http://www.physiotherapy-treatment.com/hip-replacement-rehabilitation.html. Accessed November 27, 2011. 7. Huo MH, Dumont GD, Knight JR, Mont MA. What's new in total hip arthroplasty. J BONE JOINT SURG (AM). 2011;93(20):1944-1950. http://search.ebscohost.com/login.aspx?direct=true&AuthType=ip,url,cookie,uid&db=rzh&AN=2011328499&site=ehost-live&scope=site. 8. Stryker Corporation. Direct anterior approach. http://www.aboutstryker.com/hip/procedures/procedures-daa.php. Updated 2011. Accessed November 27, 2011. 9. Nouri H, Kallel S, Hadj Slimane M, Héidi Meherzi M, Ouertatani M, Karray S. Revision total hip arthroplasty with cemented femoral component. European Journal Of Orthopaedic Surgery & Traumatology [serial online]. July 2008;18(5):327-332. Available from: Academic Search Complete, Ipswich, MA. Accessed November 30, 2011.